It has been observed that astrocyte and astrocytoma cells differ in their response to d-ribose-l-cysteine (RibCys) in the culture medium. RibCys, a prodrug of l-cysteine, elevates the level of cysteine and glutathione in both astrocytoma and astrocyte cultures. It also affects the activity of two sulfurtransferases, 3-mercaptopyruvate sulfurtransferase and rhodanese, involved in the metabolism of sulfane sulfur-containing compounds and in consequence exerts an effect on the level of sulfane sulfur. Under conditions, in which the raised level of sulfane sulfur was accompanied by an elevated activity of 3-mercaptopyruvate sulfurtransferase, the proliferation of the human astrocytome U373 line was decreased. The experiments were simultaneously performed with murine astrocytes to compare the behavior of normal cells under similar conditions. In murine astrocytes, RibCys was capable of increasing cellular proliferation, and was accompanied by a diminished level of sulfane sulfur and unchanged activity of the two sulfurtransferases. Thus, RibCys might offer a therapeutic advantage in the inhibition of astrocytoma cell proliferation. Besides, in the absence of oxidative stress, measured as the ratio of GSH/GSSG, the obtained results confirm that the fall in the level of sulfane sulfur is associated with increasing proliferation of cells, whereas a rise in the level causes a decrease in the proliferation of U373 cells. 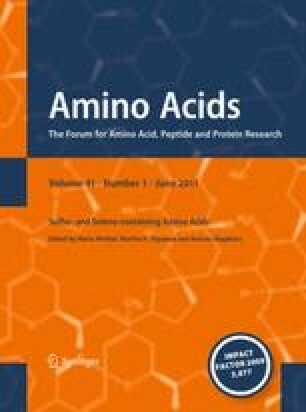 This article is part of the Special Issue on Sulfur- and Seleno-containing Amino Acids. This work was supported by a grant from the Polish Committee for Scientific Research (KBN) K/ZDS/000450 and K/ZBW/000147.